As always, the internet never ceases to amaze me when it comes to the amount of information available when it comes to #menswear, especially if you are really that into it. Put This On is hands down one of my favorite websites for this through their "web series about dressing like a grownup." One of the main reasons I started this blog was to gather information from all over the web (with proper credit to the source of course) and put it all in one place to save other men like me who want to learn but struggle with following multiple blogs, sites, email accounts etc. Quality/high-end men's shoes are usually made using either a Goodyear welt construction or a Blake/Rapid welt construction. 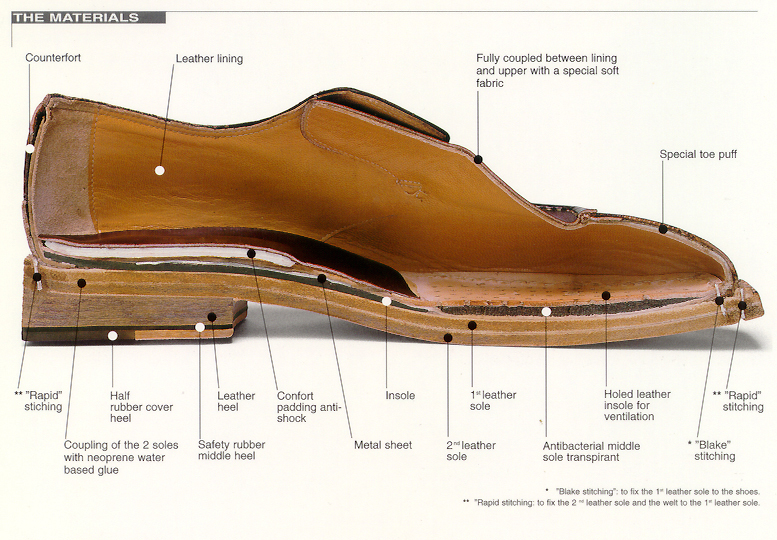 The graphic above was created by a member on StyleForum, Jcusey and is one of the best images available online showing the anatomy of a Blake/Rapid stitched shoe. The welt construction essentially refers to how the sole of a shoe is attached. With the Blake/Rapid welt construction, the stitching goes through the sole, insole and upper to attach the three pieces together and so looking on the inside, you may actually be able to see the stitching going around the perimeter of the shoe. Taking it's name from its inventor, Charles Goodyear Jr., the Goodyear welt construction is different in that there is no stitching on the interior. Despite the invention of the machinery used in the manufacture in 1869, the nature of the construction of a Goodyear welted shoe still takes longer than cheaper alternatives available. 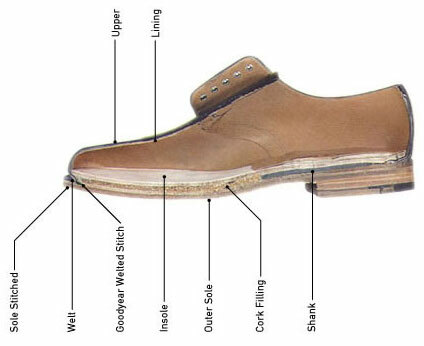 Unlike the Blake/Rapid construction, there is one line of stitching that goes through the insole, upper and a welt strip, and then another line of stitching that attaches the welt strip to the outsole (the welt strip is a piece of leather, rubber or plastic - usually leather on high quality shoes - that serves as an attach point for the sole). According to the good folks over at Put This On, knowing this stuff isn't particularly useful or important unless shoes are your business, but it is fun to know and I for one completely agree. For more information on Shoe Terminology culled from them, click here or here.